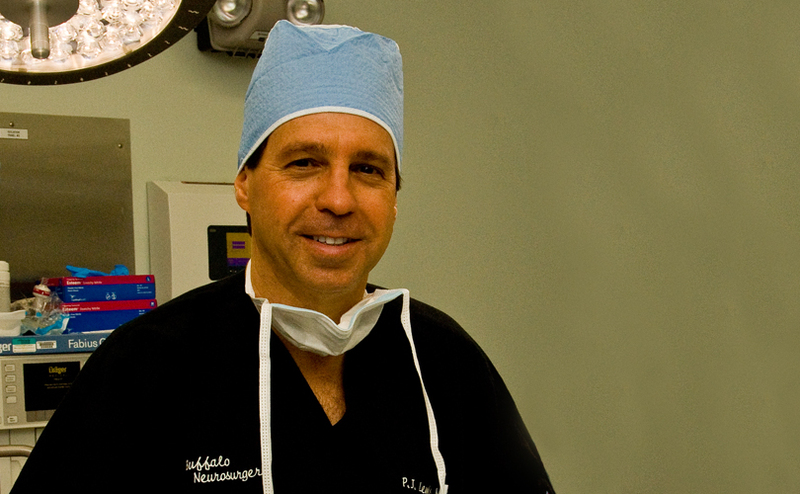 Dr. Lewis employs the latest advances in microsurgical, minimally invasive neurosurgical techniques. This allows for smaller incisions when compared to other approaches. Using the operative microscope during surgery allows him to view the operative field in minute detail, giving Dr. Lewis the ability to perform procedures that otherwise would be impossible with the unaided eye. For most patients the use of minimally invasive and micro neurosurgical techniques lead to significantly less postoperative pain, a shorter hospital stay, faster recovery and, in most cases, a better overall outcome. Dr. P. Jeffrey Lewis is Board Certified in Neurosurgery by both the Royal College of Surgeons of Canada and the American Board of Neurological Surgeons. He received his medical degree from the University of Toronto in 1982 and completed his Neurosurgical Residency in 1989 at the University of Alberta. Dr. Lewis' areas of emphasis include complex aneurysm and skull base surgery as well as microvascular decompression for trigeminal neuralgia. Additionally, he treats disorders in the spine including: herniated disc, degenerative disc, spinal stenosis, spinal infections, and tumors. Dr. Lewis works along with his surgical team: Edward Vargo, PA-C, Anthony Gagliardo, PA-C, Rachel Kistner, PA-C and Alyssa Napieralski, ST.
Dr. Lewis's office is located at the Western New York Medical Park in West Seneca, Suite A-105. He performs surgery at Mercy Hospital of Buffalo. 1.) Lewis PJ, Noseworthy TW, Fitzgerald AA, Andrew GC, Geeraert AJ: Rapid Reversal Of Ergotamine-Induced Vasospasm, J Neurol Sci 13:72-74, 1986. 2.) Lewis PJ, Weir BK, Broad RW, Grace MG: Long-Term Prospective Study Of Lumbosacral Discectomy. J Neurosurg 67:49-53, 1987. 3.) Lewis PJ, Weir BK, Nosko MG, Tanabe T, Grace MG: Intrathecal Nimodipine Therapy In A Primate Model Of Chronic Cerebral Vasospasm. Neurosurgery 22:492-500, 1988. 4.) Lewis PJ: Intrathecal Nimodipine Therapy In A Primate Model Of Chronic Cerebral Vasospasm. M.Sc. Thesis, University Of Alberta, 1987. 5.) Lewis PJ, Weir BKA, Mosko MG, Tanabe T, Grace MG: Intrathecal Nimodipine Therapy In A Primate Model Of Chronic Cerebral Vasospasm, In Wilkins Rh (Ed): Cerebral Vasospasm. New York, Raven Press, 1988, Pp 473-82. 7.) Silvers Hr, Lewis PJ, Asch, HL: Decompressive Lumbar Laminectomy For Spinal Stenosis. J Neurosurg 78:695-701, 1993. 8.) Silvers HR, Lewis PJ, Asch HL, Clabeaux DE: Lumbar Discectomy For Recurrent Disc Herniation. J Of Spinal Disorders 7:408-419, 1994. 9.) Silvers HR, Lewis PJ, Asch HL, Clabeaux DE: Lumbar Disc Excision In Patients Under 21 Years Of Age. Spine 19:2387-2391, 1994. 10.) Silvers HR, Lewis PJ, Suddaby LS, Asch HL, Clabeaux DE, Blumenson, LE: Day Surgery For Cervical Microdiscectomy: Is It Safe And Effective? J Of Spinal Disorders 9:287-293, 1996. 11.) Silvers HR, Lewis PJ, Asch HL, Clabeaux DE: Lumbar Microdiscectomy In The Elderly Patient. British J Of Neurosurg 11:16-24, 1997. Principal Investigator - Prestige ST Artificial Cervical Disc Study, 2003 – 2011. Principal Investigator - Prestige LP Artificial Cervical Disc Study, 2005 – present. Outcomes and risk factors for decompressive lumbar laminectomy. Outpatient lumbar and cervical microdiscectomy. Outcomes and risk factors for posterior lumbar interbody fusion. story. It's surprising you aren't more popular since you most certainly have the gift. Why buffaloneuro.com loads so slow?